Sia's Christmas album is amazing! "Puppies are forever, not just for Christmas," Sia sings on one of her new festive season songs. Sia's new album, 'Everyday Is Christmas', has been a major hit for the star, and its lead single, 'Santa's Coming For Us', is currently the number one song on the Adult Contemporary chart in America. The Australian singer released the track's star-studded video three weeks ago. But it's not the only song on Sia's first ever Christmas album that is causing a buzz. She has also released animated music videos for 'Ho Ho Ho', 'Candy Cane Lane', and 'Underneath the Mistletoe'. All of the songs off her 10-track album have audio versions on Sia's YouTube VEVO page. Here's a look at some of our favourite tracks from her Christmas album, which was released on November 17. Adorable puppies are a popular gifts during the festive season, but as Sia sings, "puppies are forever, not just for Christmas". Once the little pups grows older, some families end up giving them away because their cute puppies and now "not-so-cute" dogs that require a lot of hard work. Sia teamed up with American Society for the Prevention of Cruelty to Animals to encourage families to adopt this holiday, and to give their new pets love and care whether they are a puppy or a fully grown dog. 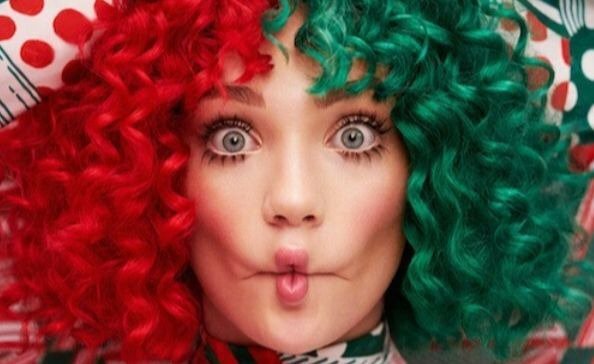 "Take a trip down Candy Cane Lane with me," Sia sings on this upbeat Christmas song. It will definitely get you in a festive mood. If you are feeling a little down this festive season, and need a little sunshine in your life, then this is the song for you. "I'll bring you sunshine," Sia promises on this track, and she does just that! ALSO READ: These #FridayLive performances rocked your 2017!